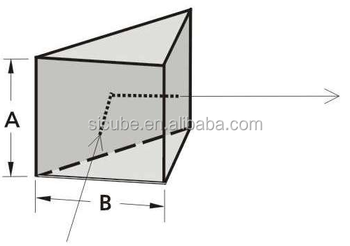 Right Angle Prisms are used to direct beams at 90 degrees by using hypotenuse face in total internal reflection (TIR). The right angle prisms are often preferable to an inclined mirror in applications involving severe acoustic or inertial loads, because they are easier to mount, and deform much less than mirror in response to external mechanical stress. As long as acceptance angle limitations for TIR from the roof faces are not exceeded, the right angle prisms can serve as a retro reflector, turning beams back to the original direction. Various HR or AR coatings are available specified in the COATINGS section. Custom fabrication also available: coating, cutting, edging, drilling according to your specification.